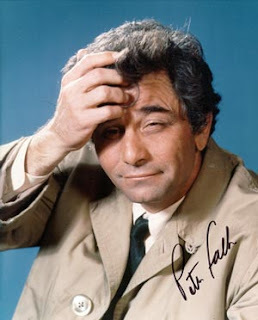 In light of the death yesterday of the brilliant actor Peter Falk, I thought it appropriate to republish this blog post, which highlights my social media and marketing "take" on Columbo's legacy. I remember that as I started writing it, it took on a life of its own, and the parallels between everything Columbo did on his show, and social media, were remarkable. I felt a little like a detective writing it, and now looking back, I know that's entirely appropriate, as writing is a lot like detective work anyway. We seek out clues, solve puzzles, and become observers of human frailties and perfections. This post originally published on April 20, 2010, and at the time was a partial tribute to Robert Culp, who passed away the month before. I admit it -- whenever an episode of "Columbo" appears on tv, I drop whatever I'm doing and watch. It's not because I haven't seen it before. In fact, I've seen most of the episodes, and more then once. So clearly it's not only about the plot, althought the plots were always suspensful and elegantly drawn out, like master business plans. It was not only about the actors, although there were some great ones, including of course, the notorious Peter Falk, who absolutley made that show. No one could image anyone other actor playing that part. Still, one could argue, why watch an episode over again if you've already seen it and know the outcome? The answer is because it's the way it's done - and the same is true for social media. While the tools do change, many of the mechanisms and principles have stayed the same, despite the fact that it is, after all, new media, and 5 years from now, new media might mean something entirely different then Facebook, Linked In, YouTube, and Twitter. So, how is social media like Columbo? 1. Just One More Thing=Variations on a Theme: Just when you think it's over, it's not. Columbo was notorious for questioning his suspects relentlessly to get the details that, in the end, would do them in. Therefore, an anecdote was never just an anecdote, a detail always meant more then itself, and a story was retold many times, in many ways by the different characters involved, within one episode. In the same way, the social media story is never really over. A blog post becomes an article, an article an e-book, an e-book a video, etc. 3. Getting the Story=Active Listening: A key element of success in the social media world is listening. In fact, many consultants like me suggest listening to what is being said online about you first, before engaging in a social media campaign. We all know about the importance of Google Alerts, for example, or Radian 6 as an important listening technology. One of the things Columbo did best was listen. He drove around visiting suspects. He jotted down notes. He noticed if one statement contradicted another. 4. Let Me Tell You About...=Authenticity: Columbo goes to Barney's Beanery for chili with ketchup and handful of crushed crackers. "Y'see, it's the crackers that make the dish," says the Lieutenant. While interviewing his suspects, Columbo peppers his conversation with home-spun comments about his wife, her proverbs for any occasion, and their family life. We also come to learn that he gets seasick, has allergies, can't swim, feels underpaid, and relies on his wife to give him a pencil every morning before work. Why do we need to know all this? Because every character worth knowing has to be a person first, and every online marketer has to be a person too. You can't just come out of nowhere and expect people to listen to you - you have to give them something to identify with. Even if you're hugely successful, your audience wants to know how you started out. It makes them feel like they can do it to. Solve murders. Publish books. Public speaking. 5. Reenactment = Feasibility. Before you publish any product, whether it be a book, course, video, or audio, you have to know that it is a valid product, that it holds water, and that it does what you say it will do. You have to relive the product in the same way an outsider would, and try to maintain objectivity. You also have to try out the products of others the same way - by sampling, or buying a small amount. One notorious charactertistic of Colombo was that he reenacted crime scenes in order to test the validity of his suspects. He tested alibis and developed theories. He also got the suspects themselves to reenact the crime, during the climactic endings to many of the episodes, and that is where they often gave themselves away. 6. Technology as Plot Device =Technology as Plot Device: In the 1973 episode "Double Exposure," with Robert Culp, a Madison Avenue ad man uses the technique of suggestive advertising and the splicing of films as a key plot device in a murder, and Columbo uses the same device to nail the murderer. Another episode revolves around a system of electronic doors that react to the clapping of hands to open and close. Others involve key timing details regarding movie projectors, cameras, and other devices. Similarly with social media, no one can argue that technology has become key in telling our stories, whether through e-book downloads, viral videos, sound bites, and other trends. With online marketing, we not only have the tools themselves being used to communicate, but countless communications surrounding the use of and education about the tools. 7. The Denouement=The "Aha" Moment: A great social media campaign always has a terrific dramatic punch, and the end of it should pack a "wow, why didn't I think of that? " moment. When Columbo has things all figured out and stages the scene where the murderer is disclosed, you can see it in his eye. The details added up, and he knows how, why, and when the murder took place. In the same way, an effective social media campaign can be this dramatic. Think Tourism Queensland, Sprinkles Cupcakes, Zappos, Old Navy, the Girl with the Dragon Tattoo. Are you a believer in the Colombo school of social media? Note: this post was partially inspired by Robert Culp, who died on March 24 at the age of 79. May he rest in peace. Thanks for giving our platform a mention in your article. What a fantastic tribute to both Peter Falk and Robert Culp here in "The Columbo School of Social Media." Loved the 7 examples you shared. Very clever! Thanks so much, Trish, and glad you liked it on behalf of Radian 6!